I recently used a Praktica Nova I for the first time, took all 36 pictures and realized that I loaded the film incorrectly. 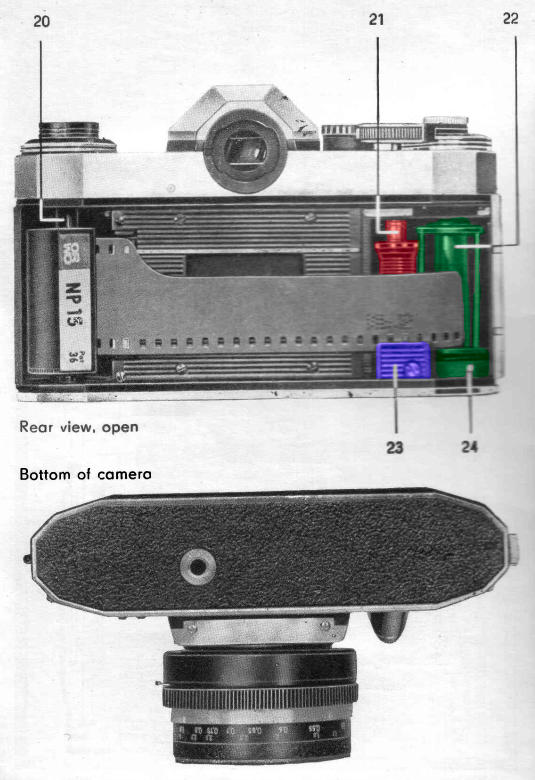 As you can see from the manual screenshots, one is supposed to insert the film into the take-up spool (22). Instead, I inserted the film to the transport sprocket (21). 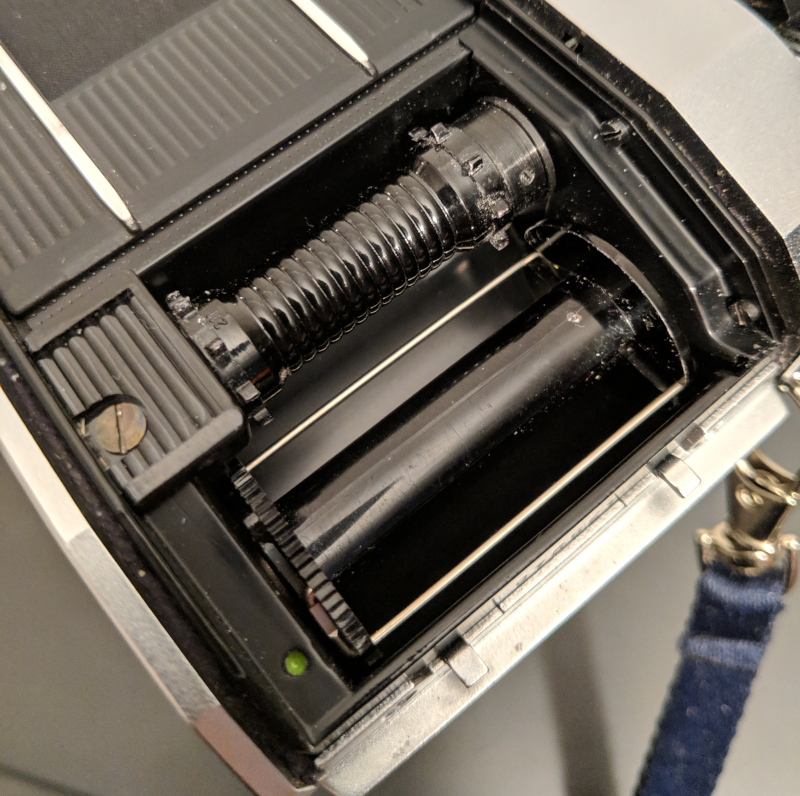 When I tried to unload the film I could not rewind it using the rewind knob (3). I also tried to manually help it in the dark room which was not successful. It feels like the film is wound around the transport sprocket (21). I cannot move it in any direction. 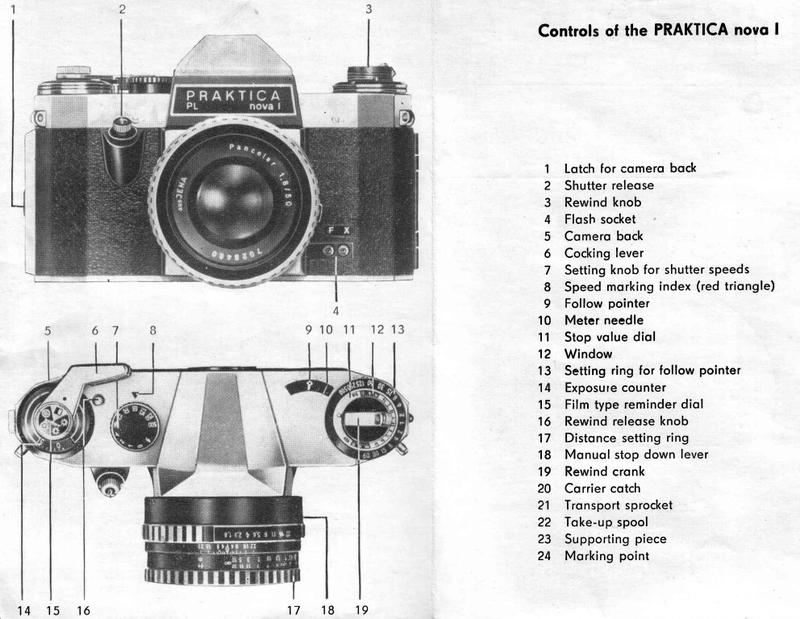 Looking at the manual I wonder if unscrewing the supporting piece (23) allows me to take out the transport sprocket (21) with the film?! I want to try to save the film from being destroyed. The last resort is to open the camera in daylight and cut the film off the transport sprocket (21). I suspect the transport spool is being held in place by a combination of friction and a stuck rewind release. I expect all frames will have some damage caused by friction, but depending on their content, may still be worth trying to save. If you haven't tried already, removing the supporting piece (23) may be worthwhile, if only to allow some room to work. Does the film still advance when you pull the cocking lever? 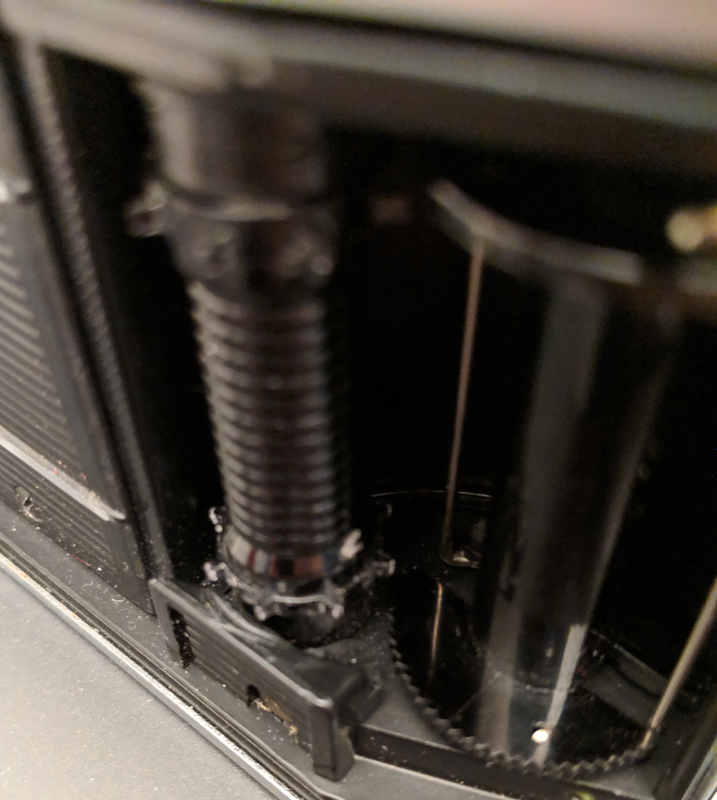 If so, you can try removing single layers of film until the spool is loose enough to unwind normally. This will involve destroying some film, but you can still attempt to develop the pieces. Cut the film near the transport spool to free the long strip of film attached to cassette. Pull the lever and fire the shutter. Pull on the free end of film while testing the rewind release. Continue cutting, winding, and testing until the film unwinds or all the film is out. If the cocking lever does not advance the film, you can still try removing layers, but the process will be more difficult and destructive to the film. After studying xiota's very helpful description I managed to get the film out in the dark with a combination of pulling the cocking lever, pressing the rewind release knob and manually pulling the film from the transport sprocket using a bit of force. I have no idea how well the film survived this torture. I will try to develop it. The camera did not get damaged as far as I can judge. 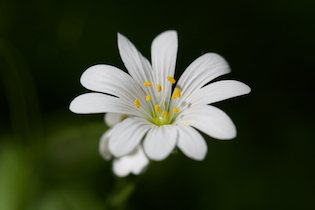 Here is two close-ups for anyone with a similar problem. I still suspect that unscrewing the supporting piece might allow to take out the transport sprocket - however I did not try this. I developed the film. It turns out only 8 pictures made it through to the transport sprocket. Some of them are exposed multiple times. The rest of the film is just empty. Also there is a crack next to the 6th picture which was certainly caused by me trying to forward the film. A. Open the camera in the light and destroy the film. B. Find a truly dark place (total darkness) retreat to this room and open the camera, remove the film, re-roll it back into the canister. This is risky business because you will be fumbling around in the dark doing an unfamiliar task. C. Best option – Take the camera unopened to a film developing shop or camera shop and ask for help. Likely they will put your camera in a dark-bag or dark-room and unload the film for you. Don’t be ashamed, it has happened to all of us in this hobby/business. Not the answer you're looking for? Browse other questions tagged film praktica or ask your own question. How can I tell if my film is over/underdeveloped? How can I repair a faded picture developed from old film left in a camera? How can I emulate film in Lightroom?